I love to shop, from everything from food items to antiques, to, of course, furniture to make-over! But one of my favorite places to shop is the curb! You would not believe the stuff people just throw away! And yes I am one of the crazy people who, on occasion, will drive around on trash day looking for great finds! I can not take full credit for this absolutely wonderful find, however, I am the one who picked it up off the curb and shoved it in my van. So I can’t quite remember if it was a Monday or Tuesday afternoon, but I got a call from my friend Amanda who asked what I was up to. I of course told her nothing, and she proceeded to tell me that she just got a phone call from her mother-in-law with a hot tip on a curb side dresser headed for the trash. 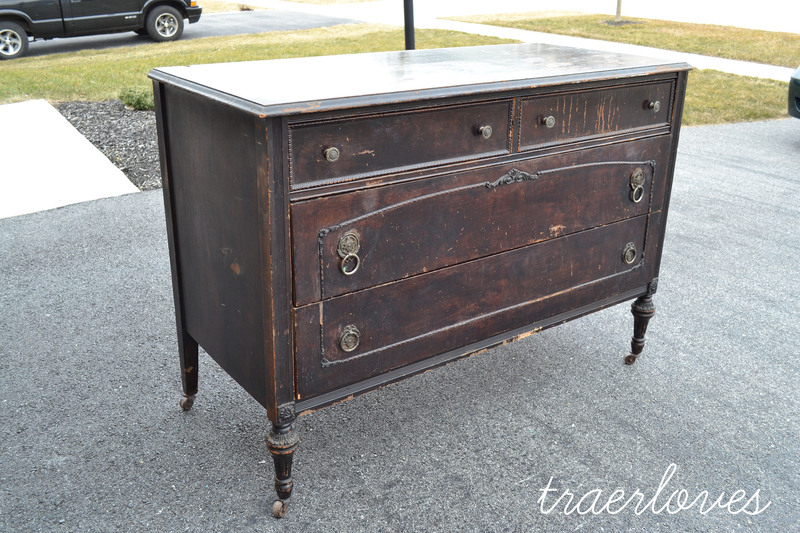 Of course with in minutes I was in my van and headed down the road with Abren strapped in his car seat ready to hunt down this “antique looking” dresser somewhere in Carlisle. Actually I was given a corner street to look for, but still it was a “hunt.” As I turned to corner of the given street my heart skipped a beat! There she was just begging to be found and made beautiful again. I looked around to make sure no one else was looking to take her and tried my hardest to lift her in my van all by myself. A kind soul happened upon me and saw that I was in distress and helped me finally get it in the van without hurting myself! 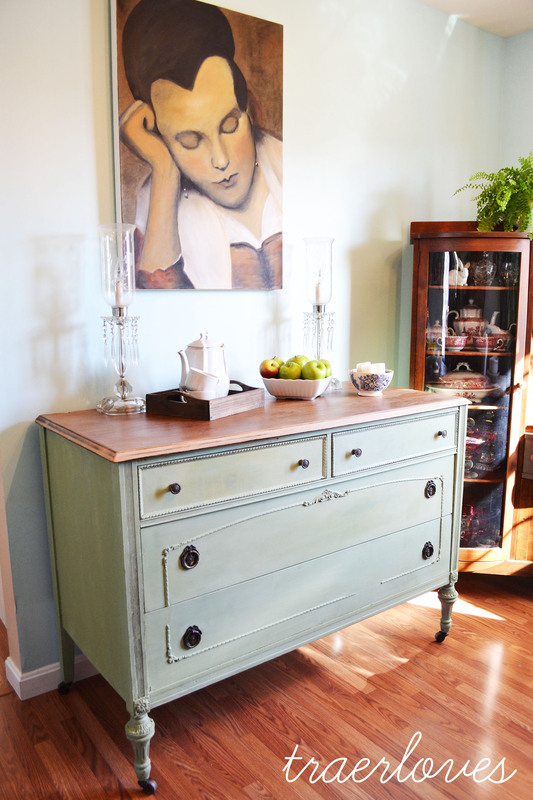 When I got her home I knew what color I was going to put on her, and that same week I sanded her down and painted her in Miss Mustard Seed’s Luckett’s green milk paint! The top I decided to leave the natural wood and put a couple of coats of wax on for a smooth finish. I took her down to the Stylish Patina Barn for the March sale this weekend. I won’t be devastated if she doesn’t sell, then I will just be forced to find a place for her in my house. What do you think? Doesn’t she have a great new life?! And look at what she looked like before! Hope you all have a great rest of the week and if you are local come and see me at the barn this weekend! P.S. If you are local and spot a great curb side find that you think I might like, please do not hesitate! Throw it in your car or give me a call! Yes, I’ve found so many pieces this way. They’re the BEST! Looks beautiful BTW. I would have a hard time giving that one up! OMG who would throw that out!!! So pretty. I’m glad you found the dresser before it was sent to the dump!